In most cases it is usually cheaper to purchase whole vegetables versus their pre-packaged counterparts. I say usually however, because there are of course times when pre-packaged veggies are less expensive than the whole version. Case in point, I went to my local Walmart just to check some prices out and compare. Here are my findings. As you can see in all of the examples above only the ruby red grapefruit was cheaper to purchase in a bag of 8 versus buying individual grapefruit. Besides saving money there are other downsides to purchasing pre-packaged produce. The biggest for me is that when produce is already in a bag you cannot inspect each piece of fruit or vegetable to make sure it is not bruised or rotting. I cannot count how many times I have purchased a bag of apples or potatoes only to find several in the bag that were inedible because they were rotting, moldy or badly bruised. When purchasing produce individually you can look each piece over and make sure that it is in good shape. Another downfall of some pre-packaged produce is that you may not eat all that produce before it goes bad. That is not usually a problem in my own household as we are a large family, but in a smaller home 8 lbs. of oranges may not be practical. When it comes to salad mix there are mixed reviews. Some say that bagged salad is healthier for you because it has been pre-washed. While some folks say just the opposite because they are pre-washed in bleach or other chemicals. 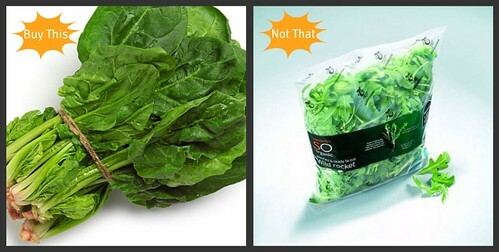 I am not sure how to weigh in on that but it seems like there have been more recalls due to E. coli because of bagged salad versus heads of lettuce. That is not to say that all pre-packaged produce foods are always going to be more expensive. There are of course loss leaders that are heavily discounted to entice you in the door and shop – one of our stores has bags of carrots for only 30¢ a pound – great deal! Plus many of the pre-packaged produce items have coupons out there for them so you may save some money that way. Think of brands such as Fresh Express, Dole, Mann’s, Cuties, Driscol and others….they are rarer but they are out there! When purchasing pre-bagged produce always check the weight of the bag. Many bags are sold as a unit price – 2 lbs. of carrots for $1.50 for example. If you are going to purchase make sure you weigh the bags on the scale. Produce when sold by weight, by law cannot be under the weight on the package, but it can be over the weight. So take a few bags to the scales and weigh them. In the above example with carrots sometimes you can find bags that weight 2.3 lbs. or 2.5 lbs. or even more for the same price of a 2 lb. bag! Overall without a coupon or a great loss leader price most of the time you will find produce priced individually to be a better deal over pre-packaged produce. However you should always do a cost comparison in the store before purchasing to make sure you are getting the best deal possible.